BACKGROUND AND PURPOSE: Early assignment of disease progression among patients with X-linked adrenoleukodystrophy (ALD) is critical for the appropriate selection of effective therapy. We evaluated the association between contrast enhancement on T1-weighted spin-echo MR images and disease progression. METHODS: Clinical charts of patients with X-linked ALD were reviewed for age, availability of MR images of the brain, severity of neurologic impairment, and duration and number of follow-up evaluations. Forty-three male patients with X-linked ALD had undergone multiple MR imaging examinations of the brain that consisted of at least sagittal and axial T1-weighted spin-echo, axial double-echo spin-echo, and contrast-enhanced axial T1-weighted spin-echo imaging. The MR images were reviewed for the presence of contrast enhancement. In addition, global disease burden, as shown by the double-echo spin-echo images, was assessed using a visual scoring method (Loes score). RESULTS: Enhancement was seen on the initial T1-weighted spin-echo MR images of 21 (49%) patients; 18 (86%) of the 21 patients had disease progression revealed by the follow-up evaluations based on MR imaging (Loes) and neurologic scores. No enhancement was seen on the initial T1-weighted spin-echo MR images of 22 (51%) patients; for 18 (82%) of the 22 patients, no evidence of disease progression was revealed by the follow-up evaluations. CONCLUSION: There is a very strong association between the presence of contrast enhancement on T1-weighted MR images and X-linked ALD progression based on clinical evaluation and MR imaging. X-linked adrenoleukodystrophy (ALD) is a rare peroxisomal disorder that affects the white matter of the CNS, adrenal cortex, and testes (1–3). The genetic defect responsible for X-linked ALD is located in Xq28, the terminal segment of the long arm of the X chromosome (4). This gene normally encodes for a peroxisomal membrane protein called ALD-P.
X-linked ALD is reliably diagnosed by a plasma assay that reveals elevated levels of saturated, very long chain fatty acids (C > 22:0) (5–8). Nevertheless, plasma assays have been found to be unreliable markers for disease progression, irrespective of subtype. Furthermore, clinical markers (neurologic and cognitive scores) are relatively insensitive to early nervous system involvement and minor disease progression (9). Pathologically, cerebral ALD is characterized by cerebral white matter demyelination, perivascular infiltrates, and loss of tight junctions resulting from an autoimmune- or cytokine-mediated inflammatory process (10). The severity of the inflammatory process has been correlated with the rapidity of disease progression (11). Contrast-enhanced T1-weighted spin-echo MR imaging may serve as a marker for the presence and the severity of this inflammatory process (12). In this study, we evaluated the association between contrast enhancement on the T1-weighted spin-echo MR images of patients with X-linked ALD and disease progression based on clinical evaluation and MR imaging scores. Our null hypothesis was that there is no association between contrast enhancement and disease progression in X-linked ALD. Clinical charts of patients with suspected X-linked ALD who were followed up at the Neuro-Genetics Center between 1992 and 1998 were reviewed for age, availability of MR images of the brain, severity of neurologic impairment, and duration and number of follow-up evaluations. Inclusion criteria were: 1) definite diagnosis of X-linked ALD by serum assay and genetic testing; 2) receiving a special dietary regimen (glyceryl triolate and trierucate oils, Lorenzo's oil) and no other therapies; 3) availability of at least two evaluations each, including a detailed neurologic assessment performed by an experienced pediatric neurologist and MR imaging of the brain. Forty-three male patients (average age at the time of the first MR imaging examination, 12.9 years; age range, 3–51 years) with X-linked ALD fulfilled the above inclusion criteria. The Kurtzke's expanded disability status scale was used for scoring the initial and follow-up clinical evaluations based on the status of pyramidal, cerebellar, brain stem, sensory, bowel, bladder, visual, auditory, and mental functions. All patients included in the study had undergone multiple MR imaging examinations of the brain that were performed at various institutions. The images were sent to the Neuro-Genetics Center. The examinations were performed in different centers between 1992 and 1998 on a variety of middle- and high-field strength MR imagers with different gradient performance capabilities. All examinations consisted of at least sagittal and axial T1-weighted spin-echo imaging (500–600/15–25 [TR/TE]), axial double-echo spin-echo imaging (2500–3500/20–30, 80–100), and contrast-enhanced (∼0.10 mmol/kg gadopentetate dimeglumine) axial T1-weighted spin-echo imaging (500–600/15–20). Internal review board approval and informed consent were obtained for the MR imaging that was performed at our institution. In addition, informed consent was obtained for reviewing the MR images that had been obtained at outside institutions. All MR images were reviewed by two experienced neuroradiologists for the presence of contrast enhancement on the T1-weighted spin-echo images. Also, global disease burden, as seen on the double-echo spin-echo images, was assessed using a visual scoring method. The severity score, described by Loes et al (13), was based on a point system derived from the location of white matter involvement and the presence of focal or global atrophy. The score range for this method was 0 (no white matter involvement and no atrophy) to 34 (white matter involvement in 33 predefined anatomic locations and global atrophy) (13). The reviewers were blinded to the neurologic findings. Disagreement between the two reviewers was resolved by consensus. For the assessment of progression of white matter involvement and persistent contrast enhancement, the first MR imaging examination was used as a reference for all subsequent examinations. The χ2 test was used to evaluate the association between the progression of disease, based on clinical and MR imaging scores, and the presence of contrast enhancement on T1-weighted spin-echo images. The χ2 test was chosen because the data were nominal and the expected frequency in each cell of the contingency tables was greater than 5. The latter safeguarded against inflation of the χ2 values. The average duration of follow-up was 18.3 months (range, 1–46 months) with the follow-up interval ranging from 1 to 12 months. The average number of follow-up evaluations, which included neurologic assessment and MR imaging examinations, was 3.1 (range, two to six). Enhancement was seen on the initial T1-weighted spin-echo MR images of 21 (49%) of the patients with X-linked ALD. 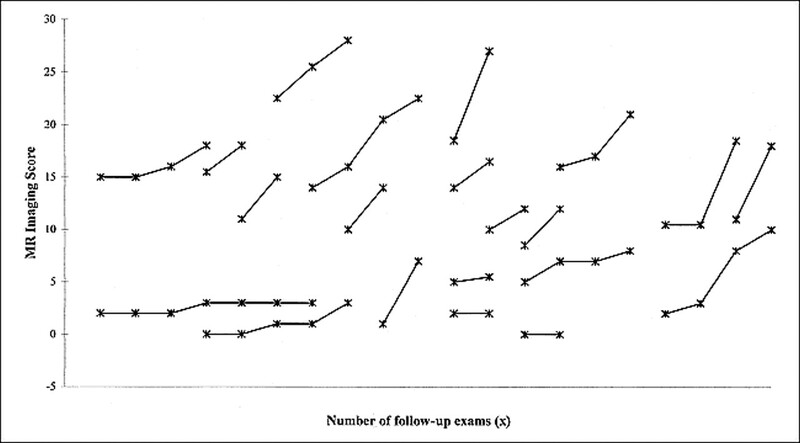 For this group, the average duration of follow-up was 13.9 months (range, 1–38 months), the average number of follow-up evaluations was 2.9 (range, two to six), and the average age at the time of the first MR imaging examination was 13.7 years. Persistent enhancement was seen on the follow-up T1-weighted spin-echo MR images of 16 (76%) patients, and no enhancement was seen on the follow-up T1-weighted spin-echo MR images of five (24%). Eighteen (86%) of the patients had disease progression revealed by the follow-up evaluations based on MR imaging (Loes) and neurologic scores (Figs 1 and 2). One patient, who was among the group of five patients whose follow-up T1-weighted spin-echo MR images did not show persistent enhancement, had no evidence of disease progression revealed by either MR imaging or neurologic evaluation (Fig 3). A second patient had disease progression revealed by MR imaging only, and a third patient had disease progression revealed by neurologic assessment only. X-linked ALD in 43-year-old man with rapidly progressive spasticity, deafness, visual deficits, and personality changes. A, Initial contrast-enhanced axial T1-weighted MR image (550/24), obtained at the level of the lateral ventricles, shows curvilinear enhancement outlining the periphery of the zone of demyelination (arrowheads). B, Contiguous axial proton density–weighted MR images (2500/30), obtained at the level of the centrum semiovale at the same time as the image shown in panel A, show very mild white matter abnormalities. C, Six-month follow-up axial proton density–weighted MR images (3000/30), obtained at a level similar to that shown in panel B, show confluent and symmetrical white matter hyperintensity in both parietal lobes (arrows), confirming the progression of disease. 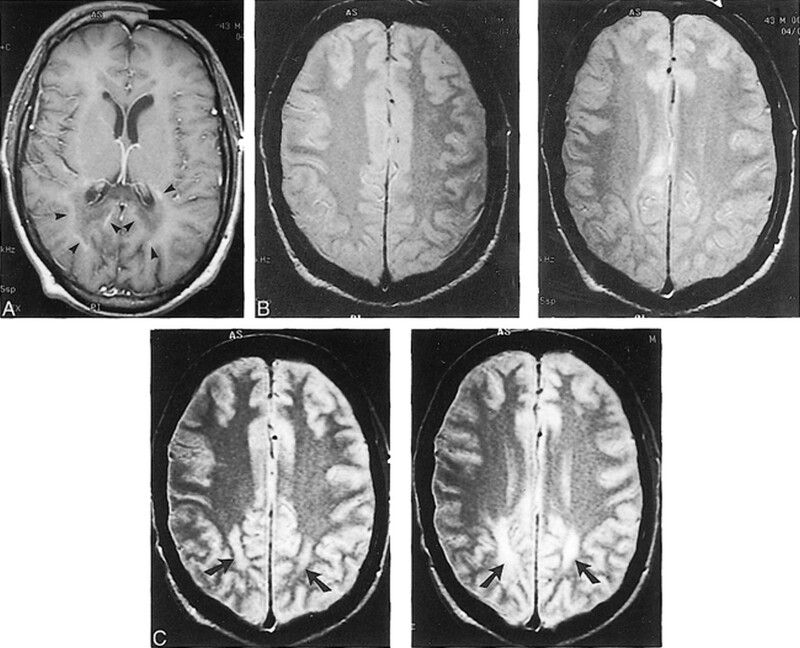 Images of a 12-year-old male patient with X-linked ALD with stable neurologic function. A, Initial contrast-enhanced axial T1-weighted MR image (500/20), obtained at the level of the splenium of the corpus callosum, shows minimal linear enhancement outlining the periphery of the zone of demyelination (arrowheads). B, Axial T2-weighted MR image (3000/100), obtained at the level of the splenium of the corpus callosum at the same time as the image shown in panel A, shows confluent and symetrical white matter hyperintensity limited the splenium of the corpus callosum and both forceps major (arrows). C, Thirty-month follow-up axial T2-weighted MR image (3000/100), obtained at a level similar to that shown in panel B, shows no interval change (arrows). No enhancement was seen on the initial and follow-up T1-weighted spin-echo MR images of 22 (51%) of the patients with X-linked ALD. 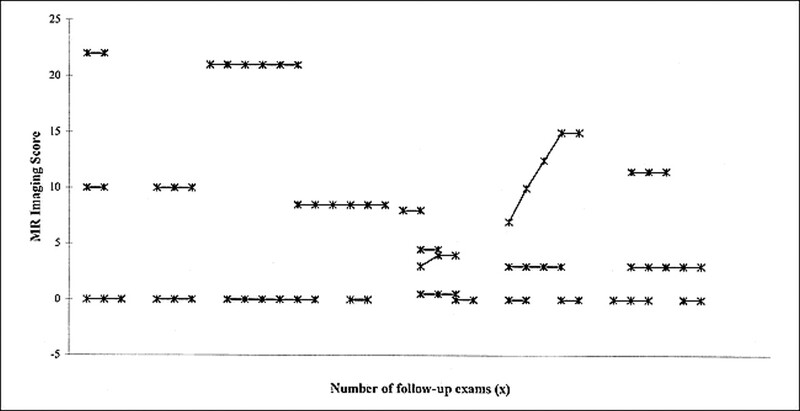 For this group, the average duration of follow-up was 22.0 months (range, 2–46 months), the average number of follow-up evaluations was 3.2 (range, two to six), and the average age at the time of the first MR imaging examination was 12.2 years. Eighteen (82%) patients had no evidence of disease progression revealed by follow-up evaluations based on MR imaging (Loes) and neurologic scores (Fig 4). There were two patients who had evidence of disease progression revealed by follow-up MR imaging only and two patients who had evidence of disease progression revealed by follow-up neurologic assessment only. There was a very strong association between the presence of contrast enhancement on the T1-weighted MR images and disease progression based on clinical and MR imaging scores (χ2 = 28.5, P < .001; χ2 = 28.5, P < .001, respectively) (Tables 1 and 2). In cases of X-linked ALD, early detection and prediction of disease progression is critical for proper management. Timely identification of patients with rapidly progressing cerebral ALD allows the institution of effective therapies such as bone marrow transplantation (14). Because of considerable associated morbidity and mortality, bone marrow transplantation is currently reserved for patients with early cerebral involvement who are at risk for rapid progression (14). Specific plasma assays and MR imaging are robust methods for the diagnosis and early detection of CNS involvement in cases of X-linked ALD (7, 8). Unfortunately, there are no established methods that can reliably predict disease progression. Characteristic contrast enhancement patterns on T1-weighted MR images in cases of cerebral ALD are well described (12). The enhancement is attributed to a breakdown of the blood-brain barrier resulting from an autoimmune- or cytokine-mediated inflammatory process (15). The severity of the inflammatory process has been correlated with the rapidity of disease progression (11). In our study, contrast enhancement seen on the T1-weighted spin-echo MR images of the brain, when present, was limited to the leading edge of the abnormal white matter. In addition to outlining the inflammatory leading edge of the demyelinating process in cases of X-linked ALD, we have found that contrast enhancement may be useful in predicting the natural history of the disease. Among the patients whose initial T1-weighted spin-echo MR images showed contrast enhancement, only one had no evidence of progression revealed by MR imaging (Loes) and neurologic scores. For that patient, there was faint edge enhancement outlining the region of demyelination, which did not persist on the follow-up enhanced T1-weighted spin-echo MR images (Fig 3). Persistent enhancement was shown on the follow-up MR images of another patient, with evidence of disease progression revealed by T2-weighted MR imaging without commensurate clinical deterioration. This can be due to disease progression into the so-called non-eloquent regions of the brain, which would not be revealed by neurologic evaluation. Detailed neuropsychological testing of patients with X-linked ALD may elicit subtle deterioration in brain function that would otherwise not be detected by neurologic testing and may better correlate with MR imaging findings (unpublished data). Persistent enhancement was shown on the follow-up MR images of a third patient, with clinical deterioration and no evidence of disease progression revealed by T2-weighted MR imaging. This can be attributed to limitations of the visual scoring method used or to eloquent brain involvement that is below the resolution (contrast and spatial) of the MR imaging protocol used. The latter explanation is supported by the MR spectroscopy data obtained from patients with X-linked ALD that showed elevation in the choline-to-total creatine ratio in regions of normal-appearing white matter on anatomic MR images (16–18). The potential limitations of this study are in part related to its retrospective nature. The lack of uniformity in the quality of the MR images and the duration of follow-up evaluation restricted clinical data to those that were available in the patients' charts. In addition, sampling bias due to socioeconomic, geographic, racial, and disease severity factors undoubtedly influenced our results. Differences in MR imagers and imaging pulse parameters may have influenced the results of the visual scoring method because of differences in MR imaging contrast and spatial resolution. Also, that a significant proportion of the MR imaging examinations were available only in hard copy format precluded the implementation of possibly more reliable, semiautomated, computer-based methods for disease quantification. The number and duration of follow-up evaluations were greater for the group of patients with unenhanced initial T1-weighted images. This is because the conditions of nearly all of the patients with enhanced initial images deteriorated clinically, and the patients were referred for bone marrow transplantation and other aggressive experimental therapies. Despite the longer follow-up, only three patients with unenhanced images had disease progression revealed by MR imaging and clinical evaluation. A reliable marker that can be predictive of the natural history of X-linked ALD is critical for the appropriate management of affected patients. We have shown a very strong association between the presence of contrast enhancement on the T1-weighted MR images and disease progression revealed by clinical evaluation and MR imaging. 1 Supported in part by National Institutes of Health grant 00052. ↵2 Address reprint requests to Elias R. Melhem, MD, Department of Radiology, The Johns Hopkins Hospital, 600 North Wolfe Street, Baltimore, MD 21287.